This journey through the heart of Australia up the Stuart Highway is one of the nations greatest drives. It follows the route of John Mcdouall Stuart, one of the early explorers who was the first to traverse the continent. It takes in most of the outback icons and is a classic Australian experience. This first leg of the journey takes you north from Adelaide, up the coast and across the face of the Eyre Peninsula. To make a day of the drive, divert through the Clare Valley and enjoy some of the lush scenery and famous wineries throughout that region. The town of Burra is an old copper mining town that is worth a look for its historical significance, and nearby Clare is also a pleasant place for a meal and a stopover. After the stopover continue on north to Port Pirie and then to Port Augusta, where you spend the first night. This diversion is if you wish to see the Flinders ranges, some of the most beautiful mountain scenery in Australia. Of course you could just continue straight without talking these two days out, its up to you. Hawker is a charming historic railway outback town, from where you can take a number of trips to explore the Flinders Range National Park. Wilpena Pound is a must see- a 17 kilometre wide geological bowl with some fantastic bushwalking opportunities. This is the leg of the journey that really takes you into the outback. Before taking off north on the Stuart Highway call into the Wadlata Information centre, which will introduce you to life in the Australian Outback. The landscapes will get sparser, there will be less signs of life and everything is a lot drier the further north you go. Make sure you fill up with fuel at every opportunity, as the outback is not a place you wish to run out of fuel in. You are now in the Opal Capital of the world! Coober Pedy is a unique desert settlement built on a long tradition of opal mining that has attracted settlers from all over the world. Due to the extreme temperatures most people live underground in houses known as burrows, dug into the desert soils. This has led to a lot of tourism to the town. You can stay in an underground motel, and visit underground museums and art galleries. Try your hand at some opal fossicking while you are there. 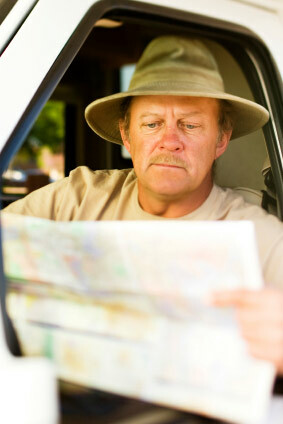 This is the longest leg of the journey, and one that you should make sure you are well prepared and rested for. The last town before you cross into the Northern Territory is Marla, where you can stock up on fuel and food and water before heading off again. The highway starts to take you through grasslands and granite country, and then across the Finke River and on to Australia�s most famous outback town. Note: If you wish to take a diversion to see Uluru (Ayers Rock), you need to take a left turn at Eridunda onto the Lasseter Highway. Continue for 268 kilometres to Yalara, which is about 18 kilometres from Uluru. After experiencing the majestic monolith retrace your steps back to the Stuart Highway and carry on northwards to Alice. Welcome to Australia�s favourite outback town! Park up in one of the many caravan parks here and spend a couple of nights resting those travel legs. There are a number of places you can visit to pass the time, such as the Alice Springs Reptile Centre or the Royal Flying Doctor Service original base. Enjoy the friendly folk and the outback characters that call Alice home, and if you feel like seeing some of the surrounding countryside then head off in your campervan to the West Macdonnell Ranges, where there are some beautiful gorges and swimming spots. Hopefully your time in Alice will have rested you for this next leg, a 500 kilometre drive through the heart of the Northern Territory. Tennant Creek sits between the tropics and the outback, and you will start to notice subtle changes in the landscape as you go. This was the sight of Australia�s last gold rush in the 1930�s, and a lot of the tourist attractions are oriented towards that. If you have time visit the Devil�s Marbles, a series of large red boulders just over an hour south of town, or take a drive through the beautiful scenery of the Davenport Range National Park. Daly Waters is the smallest settlement you are going to stay in on this trip, and for this reason alone it is worth the stopover! With a population of just 23 people, the most famous thing about this town is the pub, which is nearly a century old and was once a stopping point for drovers in the early days. There is a caravan park nearby, and you will want to pull into the pub for their famous barbeques that happen every night. Continuing north you get to Katherine, the third largest town in the Northern Territory. This town is most well known because of the Katherine Gorge, which is located in the Nitmiluk National Park close to town. This is well worth a visit, and a tour on the water will show you some fantastic sights. Another interesting place to visit are the Cutta Cutta Caves, which are home to large populations of unique bat species. In Katherine itself visit the local museum or the historic Springvale Homestead, and enjoy the friendly accommodating locals. Batchelor is a small town that is most useful as being the gateway to Litchfield National Park. If you do not intend to visit the park then continue straight onto Darwin without stopping over. Litchfield is a stunning Park, home to thick forests and towering mountains. Deep rock pools sit in steep sided gorges, uninhabited by crocodiles and safe for swimming. There are a number of stunning waterfalls to visit too, as well as other unique attractions such as the Lost City and the Termite Mounds. So this day brings you to the capital of the Northern Territory and your final port of call on the Explorers Way. Darwin is really like the cherry on the cake of your trip, and you�d want a few days to explore this special city. Cosmopolitan and tropical, there is a lot going on and a lot of beautiful scenery to see. The waterfront at Mindil Beach is host to some entertaining outdoor markets on Thursdays and Saturdays, and there are a number of great eateries along the Darwin foreshore. Other must sees are Crocodylus Park and also Aqua Scene Fish Feeding. Darwin is also a very relaxing place to just chill out and do very little after your long journey.